Jai Singh, 26, has had a passion for boxing for half of his life. His sights were set on competing in the 2012 London Olympics, when he suddenly found his vision becoming blurred! 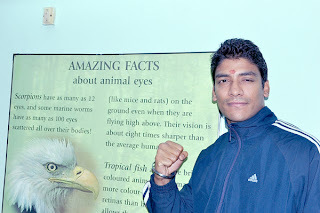 It was December 27, 2011 when Havaldar Jai Singh Patil, one of India’s leading boxers (75 kg category) found he couldn’t see very well from his left eye. He has represented India 10 times and had won the Silver medal at the Senior National Championship in Chennai recently. Now his career was at stake. Acting quickly, the Army Sports Institute at Ghorpuri, Pune, where he has been since 2005, referred him to the Command Hospital in Pune. Realizing he needed specialized care, Major Pradip Kumar referred him to Col Sonia Puri at the Military Hospital in Secunderabad as an emergency case. Jai Singh arrived at L V Prasad Eye Institute on December 31, 2011. Senior retinal specialist Dr Raja Narayanan diagnosed him with retinal detachment, probably caused a few days earlier by a glancing blow to his eye. He was immediately scheduled for surgery and operated upon. A week later Jai Singh looked cheerful! His vision had already improved and was likely to improve further. He hopes to resume training for the selection camp for the 2012 Olympic Games. He is immensely grateful to the army for their support and encouragement – good training, good coaches, good food and facilities, he adds. He is also appreciative of LVPEI, saying that everyone has been exceptionally helpful to him. We wish him good luck and a successful career! At LVPEI, training and education are recognized as key factors that influence the reach, range and quality of eye health service delivery. Therefore, the institute strives to provide the highest quality of training and education through a committed faculty. Living up to its commitments and standing true to its words, LVPEI did its best to provide education to me and helped me achieve what I wanted to. Let me take you through my journey at LVPEI and how it changed my life! I have always nurtured big dreams. I wanted to study abroad, and become a famous doctor. But the reality was very different. My father always made it clear that he could not afford higher education like medicine or engineering, or even graduation for that matter. He urged me to look out for early employment. In 1993, I saw an advertisement about a course in LVPEI in the newspaper. My father wanted me to enroll for the course; therefore he got the application form for me. Though, I was a bit reluctant initially, but then after thinking of the benefits of the course, I applied for the course and I feel I took the right decision. LVPEI gives you the opportunity to grow, which is indeed commendable about the institute. If one works for 5 years, and shows his commitment towards his work, the institute offers the opportunity to pursue higher studies including PhD. This was a great opportunity for me as I could not afford to live my dream. LVPEI gave me the platform and the opportunity to fulfill my dream. This system was unique as you got to work and study simultaneously. Only with the help and constant support from LVPEI, was I able to live my dream. When I expressed my interest in public health to the Chairman in one of the meetings, he gave me a part time position at ICARE to allow me time for study. I went to the London School of Hygiene and Tropical Medicine, University of London, for my higher education in Public Health in eye care. Since then there has been no looking back. It has been a long journey and beyond doubt, this journey would not have been possible without the institute’s support. Considering the financial background I come from, I could not have accomplished all of this. Being a first generation graduate in my family, hailing from a lower middle class background, and to reach the position that I am in today is a result of my persistent efforts, patience and the support of the institute. “You become more powerful, when you help the helpless in remote rural areas”. “When I started my journey, I was alone, swimming against the tides of the sea to bring quality eye care to India, and thought I will swim as long as I am tired, now 25 years down the line, I have several hands joining me to swim against the tide to make the difference.” These are the few of the many statements of Dr. Rao that gave me inspiration to move on. The satisfaction in everything that I do, and the feeling that I am part of the team that is bringing change among those who are underprivileged, remain my motivating factors. I am not the only one who was given opportunities by the institute, the only difference is that others who got these opportunities left the institute and I stayed back to reach the position where I am today. One thing that I have learnt at LVPEI is, when you aim to achieve something, you should put in your best, be patient and focused single-mindedly towards achieving that goal. I am greatly indebted to LVPEI for all the support that I have received over the years. I know it can never be repaid, but I want to do as much as I can and be a torch bearer to take the vision and mission of this institute forward. 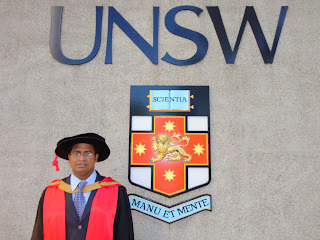 As narrated by Dr Srinivas Marmamula who had joined LVPEI after his high school (Plus Two) as a student of the institute’s DOT (Diploma in Ophthalmic Technology) program, and went on to do his Masters in Public Health in eye care from the London School of Hygiene and Tropical Medicine, University of London, and then on to obtain his PhD from the University of New South Wales, Australia. Dr Srinivas Marmamula is Associate Optometrist and Public Health Specialist at LVPEI’s International Centre for Advancement of Rural Eye care. His study programs abroad were fully sponsored by the Institute, and he was paid his remuneration in full during the entire duration of study so as to facilitate his pursuit of higher education. I have arrived safely at my home last night after almost 26 hours of leaving your wonderful institute. I am honoured and pleased to have spent the past month in your institute in which I have had the most fruitful and enjoyable experience of my life. A simple word as “Thank you” is not sufficient to express the amount of gratitude I bear to everyone in L V Prasad. Everyone has been absolutely kind and infinitely cooperative and friendly; you made me feel at home, like being amidst brothers and sisters. I wish to thank everyone belonging to LV Prasad, from the highest authority to that simple young man from the house-keeping who used to meet me with an inviting kind smile every afternoon as I saw him tidying my room in the guest house. Dear Dr Mandal Sir, I wish to thank you from the depth of my heart, for you have given me the experience of my life. I came to you to learn just pediatric glaucoma, and I ended up taking home a lifetime of experience, a whole package of values and virtues and human touches. I will never forget your constant words “Be sincere, don’t show sincere, but BE sincere”. The way you deal with these poor children and their parents is in-itself a value to learn; how to LOVE what you are doing, and how you speak of your past teachers with such gratitude and appreciation. Dear Dr G Chandra Sekhar, I wish to find words that describe my gratitude to you adequately, but my vocabulary falls short. To me, you redefine the meaning of the words “Teacher” and “Doctor”. You model the value of a teacher who conveys every single piece of his knowledge and experience with extreme faith and devotion .You think of your patient’s best as a human being and yet humbly say that “this is just the proper medical decision”. You recognize your students through their hand writing, a sign of utmost dedication. Dear Dr Sirisha, you have given me a valuable lesson on how to maintain the impossible balance between hard work and calmness, between utmost knowledge, experience and humility. I really appreciate your elaborate answering of all my questions with patience and I hope I was not a nuisance! I wish to thank you for your excellent illustration of surgical dexterity and resourcefulness in complex surgeries. And above all Dr Sirisha, I and my wife are extremely grateful to you for that wonderful gift that you gave to my wife, it was very thoughtful on your part and we will cherish it always. Dear Dr Nikhil, the short encounter that I had with you made me wish it was longer. I have learnt from you a new definition of “doing my best” in examining the patient. That single day that I spent with you has changed my view of the concept of patient examination and systematic thinking. The accuracy and thoroughness of examination, irrespective of time constraints, that you have shown me will definitely help me in my practice. Dear Dr Subho, I have used a lot of your precious time. I have not responded about the participation of my institution in the genetic study because I had not (and still have not, unfortunately) received a response from my seniors. I appreciate you for presenting me with this opportunity. Please wish me luck with my seniors because I wish to proceed with these genetic studies for the sake of our poor patients, though I understand it is on the long run. Dear Dr Ravi, Dr Paraj and Dr Shaeel. I don’t know how to thank you. You were like brothers to me. I have never known friends that were supportive and kind and sincere as you are. I envy your superiors for having such a great team as yours, and I envy your institute for having such great graduates. Dr Ravi, you have provided me with guidance and help from my very first moment, and I don’t think my stay in L V Prasad could have been that fruitful without your help. You’re a great person and one day I know I will be reading your work in a first class journal or book; keep up the good work my friend. Dr Paraj, thank you for tolerating me in the OPD, and for answering all my questions. You were such great company and a helpful, knowledgeable guide; I wish you all the best in your career. Dr Shaeel, I will surely remember that calm smiling face of yours. Dear Doctors in the education department, I wish to thank you all for the cooperation and help you provided from the very first moment, and even actually before I arrived at LVPEI. Madame Vijaya, my stay could not have been more comfortable, and your help made everything so easy. If I sum it all, I have had the best experience in my life. From the very beginning, I was given the wonderful advantage of choosing the timing of my observership; I was helped with the Visa application with a letter directed to the embassy. A wonderful room was reserved for me in the guest house at a remarkably good rate, with a three meal excellent food at an excellent price. I have met the most knowledgeable consultants, the most excellent teachers and the most helpful and friendly fellows. I was helped by an extremely helpful administration in the education department up to the very last moment of booking the taxi to the airport. And there was definitely a lot more than I could count or remember. To my surprise, I did not face any negative issue. I don’t think I can attribute this to my luck, I know that this is a result of the excellent planning and faithful contribution of all the personnel in this wonderful place. Thank you all for everything, thank you for accepting me in your wonderful institute and on behalf of all your patients, thank you for the great job you are doing. “Sure, come to India and see how we do it,” Dr. Sangwan from LVPEI warmly told me when I asked about a potential visit. Little did I know that my stay at LVPEI would leave such lasting impressions! For over three years, I had been researching about limbal stem cells and their properties. I had extensive experience in growing the cells and made exciting discoveries. Each time I spoke about or presented my work, I began with the devastating disease that is LSCD (Limbal Stem Cell Deficiency) and the unbelievable surgery that allows people with this disease to see. It was this amazing clinical application that drove my interest in my research. Each day, I knew my findings had the potential to enable someone who had lost vision to regain their sight. When I saw Dr. Sangwan's keynote presentation at IOSS (International Ocular Surface Society), I was convinced that to see this work in person was the most fitting culmination to my full-year Doris Duke research experience. 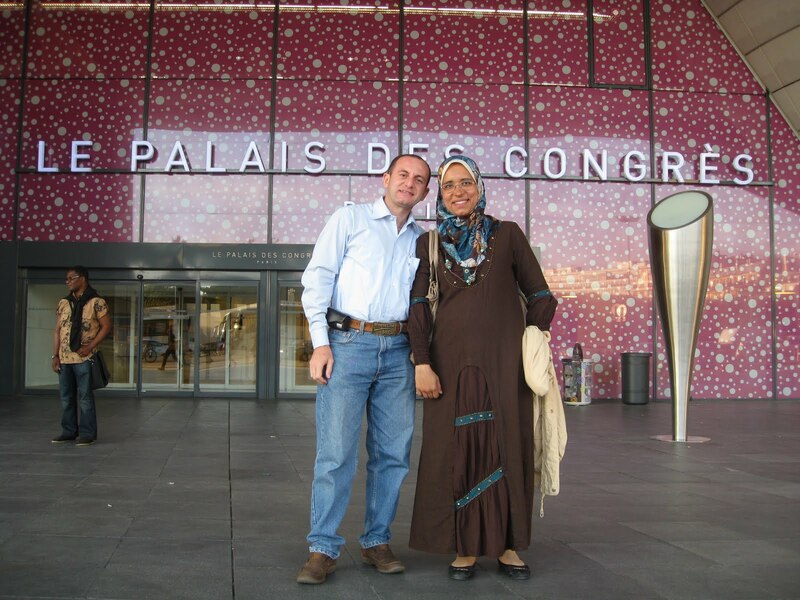 I could see that Dr. Sangwan was very driven and his passion to heal and cure was clear. Dr. Sangwan seemed somewhat of a lone voice at the conference, as many people were researching LSCD but few, if any, were putting this research to use in the real world. My trepidation on the flight to India fell away as Dr. Sangwan smiled and introduced me to some of the fellows. I was anxious about being in another country and wondered whether I had made the right decision in visiting for an entire month. In our first two hours, we saw 25 patients, many of whom had ocular disease I had only read about and that I would likely never see back home. Within two hours of my arrival, I had seen a patient with LSCD! At the end of the day, I was a little jetlagged but running on adrenaline from the excitement of the patients I had seen that day - we had spent 12 hours and seen over 100 patients. Each day, I was able to see cases that are extremely uncommon back home. I read ophthalmology texts daily and due to the sheer number of patients, I would inevitably see two or three diseases I had read about, hours after my studies. I cannot think of a better way to learn, I gained experience with the slit lamp and read much more enthusiastically, as everything, even the rarest of diseases, came up day after day in the clinic. One of the things that impressed me most was that Dr. Sangwan and LVPEI place a lot of significance on knowing how all aspects of the system work. It was clear to me that this intricate knowledge of the basic workings of the hospital is both essential and invaluable. I decided to use this approach to learn more about all of the tests I would eventually prescribe to my patients. This proved to be extremely helpful. In one visit to the B-scan room, I saw 20 patients with all types of pathology, from RD to phthisis to normal eyes. The techs were surprisingly helpful and took time to explain each aspect of the test in detail. Similarly, I was lucky enough to lean about the OrbScan, Anterior OCT, and several other tests that allowed me to understand much more fully the applications and limitations of each test. LVPEI's specialized nature and high clinical volume make it a unique place in which this is possible. The combination of a plethora of diagnoses and such a large patient load meant that I got to see more patients and types of diseases than I ever had before. I have no doubt that this experience put me well beyond my peers, as ophthalmology is a field where visual learning and memorization of visible pathology are invaluable tools. The experience that gave me the most valuable insight into the LVPEI system was the day I spent seeing each part of the LVPEI pyramid. LVPEI has an unbelievably well thought out system for reaching every single person in the area. The system begins from the lowest level in the villages, one of which we visited. This level consists of one person per village who goes door to door measuring visual acuity (VA), glucose levels, height, and weight. The same information is recorded by teachers and headmasters, who are taught to spot children with low vision and given flashlights and VA charts to check their students. The data is then used to forward diabetes and low vision suspects to the next level of care that we visited, the village center. There, technicians measure vision, refraction, ocular pressure, and look at the patient using the slit lamp. Anyone with refractive error is prescribed glasses, free for those under 16 and very cheap for others. These centers see about 450 patients a month and give out glasses to 250 of them. Those who have a visual deficit that cannot be corrected using glasses alone are sent up the chain to secondary centers. At the secondary centers, medical care, such as drops and medicines, and basic surgical care, such as cataracts, DCR, and pterygium, are handled. Students from the major/tertiary centers spend six months to one year being second doctor at these centers. These centers have an outpatient clinic and inpatients as well. The center we visited saw 1100 patients in clinic and performed 140 surgeries per month. If treatment at a secondary center is not able to correct the issue, they are sent to a tertiary center where things like glaucoma surgeries and vitrectomies are done. The most complex cases, in turn, are sent to centers of excellence such as the KAR campus at which I spent the majority of my visit. In all cases, patients pay what they are able. More than half do not pay at all, while some of the richest pay for luxury rooms and subsidize the cost in this way. I spent one day seeing each of these components, and it was amazing. We drove two to three hours out from Hyderabad, a major city, to a tiny rural village. I'm glad I got to do this before leaving the country. I had a fantastic experience at LVPEI and would like to thank Dr. Sangwan and the other doctors, residents, and staff for welcoming and hosting me. I will most certainly be returning to LVPEI, especially once I have more experience working in the field of ophthalmology, as the experience will be invaluable to my growth as a doctor and a human being. As narrated by Alexander Barash, a final year medical student from Mount Sinai, NY, who spent one with LVPEI for his elective posting.